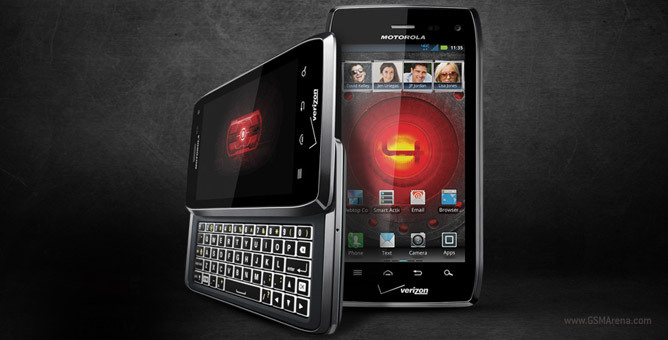 The slide-out QWERTY sporting Motorola Droid 4 is one of the fastest product sequels I’ve seen in quite some time. The Android smartphone hit the shelves at Verizon Wireless only six months after its predecessor, Motorola Droid 3 arrived, thus making me curious about the changes it has brought with it. Speaking about changes in the newcomer, they are actually quite a few. The Droid 4 has seen a healthy bump in its CPU speed and RAM memory, compared to the third installment in the lineup. The handset also features LTE connectivity on board, along with revised exterior design and Android UI. The latter bring it right in line with the Droid RAZR lineup. As you probably know, Motorola Droid 4 is a LTE/CDMA device, which is why you won’t find it in the usual review section of GSMArena.com. As the only dual-core and LTE featuring, hardware QWERTY handset currently on sale in the United States, the Droid 4 deserves plenty of attention. So go ahead and enjoy this short version of our trademark reviews. As always, I’ll get things cracking by taking a look at the smartphone’s key features. The list get completed with the usual full connectivity set and Motorola’s exclusive software tricks. A closer look at the above highlights will tell you that, in more than one way, the Motorola Droid 4 is actually a Droid RAZR with a QWERTY keyboard – not a bad thing as I came to like both versions of the RAZR. Below are some of the Droid 4′s features, which I did not fancy that much. Believe it or not, the Motorola Droid 4 is currently the only dual-core and LTE packing, Android smartphone with a hardware QWERTY on sale in the United States. This means that the Moto has practically no competition to face. Regarding this one – I am sure that neither Motorola, nor Verizon Wireless have anything against such state of affairs. There is nothing but the bare essentials in the small retail box of the Motorola Droid 4. All you are going to find inside is a charger, a USB cable, as well as a small key for removing the battery cover. The lack of memory card in the bundle is easily excusable due to the massive amount of built-in memory. I do believe however, that a bundled pair of headphones would have been a welcome sight. Design wise, the Motorola Droid 4 has adopted the looks of the Droid RAZR. The device has the same, slightly octagonal shape of its ultra-slim, non-QWERTY relative. The Motorola Droid 3 wasn’t exactly a looker of a smartphone. One particularly curious design solution in the Droid 4 is the use of a key lock (no, I’m not kidding) to remove the back cover. While the battery itself is non removable, the microSIM and microSD card slots can be found under it. The tiny key, necessary for the operation, can be found in the retail package. The build quality of the smartphone is unsurprisingly solid. The materials used in the Droid 4 however, are not as premium as the ones used in the RAZR – you won’t get Corning Gorilla Glass, Kevlar, as well as the same generous amount of metal in the QWERTY droid. A weight concern is the most probable cause for this omission. The measures of Motorola Droid 4 are 127 x 67.3 x 12.7 mm, while the handset’s weight tips the scale at the acceptable for a QWERTY smartphone 179 grams. The thickness of the Droid 4 is the price you will pay about having one the best QWERTY keyboards around. Speaking of the QWERTY, I can attest it’s really a wonderful thing. Heck, with five rows of laser cut, perfectly spaced, superbly illuminated keys, the Motorola Droid 4 is ready to give a bloody nose even to RIM’s lineup. The slide-out mechanism feels extremely solid, while getting used to the keyboard is a matter of minutes. The 4″ LCD display with qHD resolution of the Droid 4 looks good on paper. Its PenTile nature however, seriously lowers the perceived resolution. I could see the actual pixels of the unit without taking a closer look – a hard to forgive experience on a display with a pixel density of 275ppi. The contrast ratio is also sub-par – the screen is practically not capable of displaying even a remote resemblance of black color. On this occasion, I can wholeheartedly say that Motorola would have been far better off, had they stuck to an AMOLED display. The 1785mAh battery is not a particularly strong point either. You have to be really careful with the usage of your phone, in order to make it last a full day. And by full day, I mean 10-12 hours. In case you are a heavy user, just have a charger on you, or buy a RAZR MAXX instead. The device lasts much longer when you leave it alone in standby only, but I doubt many people will be doing so. Handling the Motorola Droid 4 is a breeze. The device’s dimensions allow even one handed use, so long as the QWERTY stays in. When you use the hardware keyboard, two handed use is the only way to go. There were no surprises with the build quality of the Motorola Droid 4. The device is extremely well put together. The battery performance could have been way better, while the screen is downright unimpressive. Motorola Droid 4 comes with Android 2.3.6 Gingerbread out of the box. Check it out in action below. The OS is dressed in the same UI as the RAZR family, and, as you can notice in the video above, offers the exact same functionality with the added landscape support for using it with the hardware QWERTY out. Just like with the Motorola Droid RAZR MAXX, which was on my hands not so long ago, the folks at Verizon Wireless have gone out of their way to fill up the device with a massive amount of unnecessary bloatware. Once again, there is a separate group in the launcher, dedicated to it. What makes things even worse, is the fact that most of the apps cannot be uninstalled easily. While most people might not care about it, carrier proprietary apps are a serious issue for me. Most major providers in the United States have already addressed this issue. Verizon Wireless however is still not part of this group. Since this is a short version of our usual reviews, I am not going to dig deeply into the software of the Motorola Droid 4. For the full scoop on its functionality, you can check out the software section of our full RAZR review here. The Motorola Droid 4 packs the same CPU and chipset as the Droid RAZR MAXX and its benchmark scores are identical. The device did well in some of the test, and posted average scores in others. See some of the results below. It is well known by now that benchmark results often have little in common with the real life experience, which a device offers. The Droid 4 is yet another example. To put it simply – the device feels extremely fast and responsive. You will be really hard pressed to find even the slightest presence of lag, regardless of what task you throw its way. The camera of the Motorola Droid 4 is an 8MP autofocus unit with LED flash – right in line with the top smartphones on the market today. The interface is simple and intuitive. You can start the camera straight from the lock screen with a swiping gesture. I was also pleasantly surprised by the speed with which it captured photos. The Motorola Droid 4 produces generally nice 8MP photos. The colors are relatively ok (as far as we could tell in the rainy weather) and so is contrast and overall sharpness. The digital noise is a bit high but if you don’t zoom in at 100% on the photos, that’s hard to tell. The camcorder of the Droid 4 can capture full HD videos at 30fps. Its interface is no different from the still camera one. The FullHD videos produced by the Droid 4 are nicely smooth at 30fps. The image quality is like the one produced by the still camera. The noise is a bit high, but everything else, including the sharpness, seems fine. That’s no surprise with a video bitrate of 15.3Mbps. Audio is recorded in stereo at 128Kbps/44.1KHz. Here are a couple of samples for you. Motorola Droid 4 offers you more connectivity options than you can possibly need. Along with the usual Wi-Fi, Bluetooth, etc., the droid can connect to Motorola’s lapdocks, and transform itself into a seriously productive notebook. The most important connectivity feature however (and the one you will end up using the most), is Verizon’s speedy LTE network. The wireless carrier was the first to employ LTE in the United States, so you will benefit from the best developed 4G network in the country. In my experience with the device in NYC, I had full coverage everywhere, along with great network speeds. Being a fairly quick sequel, the Motorola Droid 4 is not as complete as it should be for its $199.99 price range and high-end ambitions. The screen and battery performance are definitely not the stuff dreams are made of, and I am not sure that the handset’s solid build quality and fantastic QWERTY will be enough to offset those two. I am somehow left with the impression that the lack of direct competition in the hardware QWERTY segment has played a negative role in the device’s development. So if hardware QWERTY, Android and LTE are your thing, and you are prone to make a compromise on battery life, the Motorola Droid 4 might be the device for you. Otherwise, I would advise you to get a Droid RAZR MAXX for extra $100. I promise you that you will find the experience it offers much more rewarding. Motorola and Verizon surely won’t mind here.